Gimpel Fils and James Hyman Gallery are delighted to present a joint exhibition of recent paintings by Alan Davie. The Shaman's Enigma brings together a collection of Davie's word paintings made since 2005, which not only attest to his continued artistic output, but also demonstrate the central importance of text in his work. Over the past sixty years, Davie's vast body of work has followed a distinct stylistic trajectory. Each decade has seen him develop his artistic vocabulary, drawing on a range of life experiences and inspirations. Since his early experiments with Jungian theory in the 1950s, the artist as a Shamanic figure has been central to the development of Davie's work. The Shaman quickly became an important symbol and channel for expression, and Davie has developed a complex iconography in response to it. Each painting is richly layered with signs, symbols, pictures and text. He has never failed to communicate his constant necessity of keeping in contact with a magical, natural flow, when making work: 'I either keep with it, or I get lost' he has stated. Heavily influenced by his international travel Davie cultivated his preoccupation with ethnographic art and culture. Davie's words and phrases are painted in a variety of different languages, including English, French, Spanish, Portuguese and Latin. Also present in the paintings are scripts incorporated from Aboriginal symbols and Carib petroglyphs. The Shaman's Enigma traces the shifting nature of Davie's engagement with words, from the playful to the serious, the surreal to the prosaic, the simple to the complex. A fully illustrated catalogue with an essay by James Hyman will accompany this exhibition. This major exhibition will also travel to France and Ireland. Born in Scotland in 1920, Alan Davie's first solo show at Gimpel Fils took place in 1950. His last major retrospective exhibition was staged at The Tate St. Ives in 2003-4. 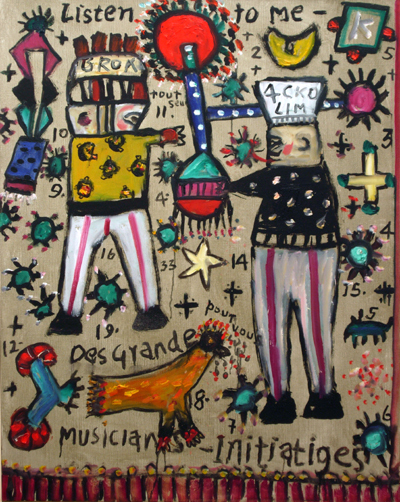 Other exhibitions of Alan Davie's artwork include The Barbican Art Gallery, London (1993), The Scottish National Gallery of Modern Art, Edinburgh (1997), COBRA Museum, Amstelveen (2001). His work can be found in numerous international public collections including Tate Modern, London, The Scottish National Gallery of Modern Art, Edinburgh, the Peggy Guggenheim Collection, Venice, Museum of Modern Art, New York, Stedelijk Museum Amsterdam, and Museu de Arte Contemporanea, São Paulo. Arabella Hope's large-scale paintings explore the intimate spaces of domestic bathrooms. The works of art included in this exhibition encourage us to consider how we experience private places, and how our use and perception of bathrooms shape our thoughts, memories and dreams. Accepting that emptiness is part of our everyday life, Hope's domestic interiors are devoid of people, and her works open up a space in which we can contemplate the rituals associated with cleaning and washing ourselves. Bathrooms are spaces where we reflect upon our bodies, where we are most vulnerable in our nakedness. They can be places where we find our true selves, or where we create a self that we want the world to see. This changeable, vulnerable aspect of life is translated into an uncanny absence in Hope's work, but which is balanced by her extraordinary use of colour and texture. A meditative stillness is expressed with an astonishing strength of colour in Hope's work, and calls to mind the bathroom paintings of Pierre Bonnard. Like the French artist, Hope balances her interest in her subject matter with a concern with form and the practice of painting. Each work of art can be regarded as a field of colour, comprised of overlapping planes and patterns. Areas are balanced between coolness and warmth; the curve of the bathtub contrasts the systematic grids of the rectangular bathroom walls to create images that are both intimate and intense. Hope's work makes a virtue of empty space and her skill is to keep the surfaces of her paintings meaningful without depicting incidents or activity. Arabella Hope studied at Leith School of Art before graduating from Glasgow School of Art in 2007. She was selected to exhibit in BraveArt, an exhibition of the best Scottish graduates, in September 2007, and more recently included work in the New Graduates 2007 exhibition at Pentagon Gallery, Glasgow. This is her first solo exhibition.